So while I am currently 10000 m up into the sky flying back to Copenhagen. I thought it was no better time to reflect on my 16th place finish yesterday in Madrid WCS. Going into Madrid I was very confident with my most recent block of training. I was able to take many positives from my early season races whilst working hard on the areas that prevented me from ensuring I was consistent in all my performances. A lot of the training sessions I conduct are based purely on past race experiences and specific areas that need improving. Having such a close support network ensures that each race is analysed in great depth which allows us to pinpoint exactly the areas that need to be improved during the next block of training. Having really worked hard in my weaker areas I was on the start line in Madrid confident and sure I could race hard and perform well. 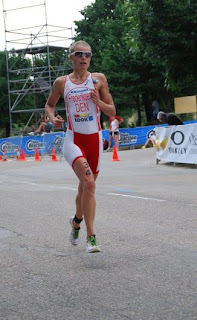 Race conditions were great; 27-degree air temperature ensured a hot day of racing. 23.8-degree water temperature made for pleasant swimming without a wetsuit. As many of you will be aware I have not truly established myself as an ’exceptional’ open water swimmer. Based on my pool times I should be regarded as one of the fastest swimmers in the sport, but this sport counts for nothing if you can’t adapt to open water swimming. This is something I have learnt the hard way. Prompting me to adopt a new approach to swimming. One approach I have adopted is that I now train in the pool as a Triathlete not a swimmer. I swim triathlon specific sessions…. hard, very hard!! I use equipment that will only benefit open water swimming and I have adapted my technique to enable me to become more suited to open water. This sport is changing so quickly therefore it is important I change with it. Along with adapting my swim training I have now taken a new approach to open water swimming and judging by my swim this weekend something has worked. After a very solid swim I exited the water in 8th position. Having established this position after around 300m it was a great confidence boost to hold it for the entire swim. he chase pack around 30 seconds down after lap 1. The main group was made up of 16 athletes and included some big names Helen Jenkins (GBR), Lisa Norden (SWE), Paula Findlay (CAN), Barbara Riveros (CHI) and Andrea Hewitt (NZL). 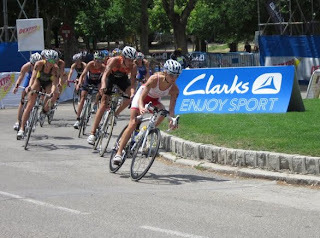 I was not short of company in the chase group with the likes of Emma Moffat (AUS), Daniela Ryf (SUI), Vicky Holland (GBR) and Annabel Luxford (AUS) in the same group, it seemed I was not the only one taking time to find my cycling legs. Our group worked well and we needed too with a 3rd pack containing Emma Snowsill (AUS), Carole Peon (FRA) and Anne Haug (GER) pushing hard to catch. Throughout the very tough 40km ride the gaps yoyo’d many times but entering T2 it was clear the leaders would come from the front group. 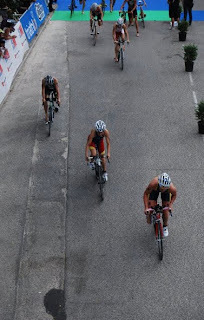 A 30 second gap to leaders meant I needed my ’A Game’ running legs if I was to gain a top 10 position. Very shortly into the run it was clear the ride had taken a lot out of me and I did not have my ’A Game’ running legs with me. My legs were heavy, very heavy so it was important that I composed myself and did not try and seek something that was not there. My focus now was to run solid and gain good Olympic points. I quickly decided to build into my run. I had great support out on the course, which was duly needed at many points. I was able to maintain a solid run and hold my position finishing in 16th overall. I would not say it was exceptional run and definitely does not reflect my true running form. However Madrid is a tough race, which is evident from the gaps in the finish times. It is very rare you see the top 30 girls spread out over 6 minutes a clear indication of how much the Madrid bike course takes it out of you. All credit to the top 4 girls, Paula Findlay (CAN), Helen Jenkins (GBR), Emmie Charayron (FRA), Andrea Hewitt (NZL) they ran exceptionally well and quick. I am very satisfied with my performance, it has given me great confidence in many areas where I was lacking and showed me areas that require more attention. I have gained great Olympic points from this result, which is my sole focus for this 2011 season. I now look forward to racing on home sole next weekend at Fredericia, Denmark to try and regain my Danish Championship title, which I lost due to a Puncture in 2010. Two weeks later I will then head to Pontevedra, Spain to battle for title of European Champion. I hope you enjoyed this latest blog entry. Thanks for all your support. Will keep you posted on developments over the coming weeks.